It’s the grand finale, people. 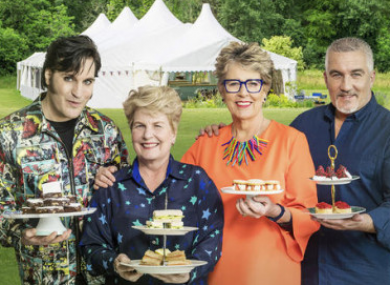 Tonight, the three finalists will be required to prepare a selection of doughnuts, navigate that oh-so-turbulent technical challenge before serving up a showstopper which they hope will win over judges, Paul Hollywood and Prue Leith. But who will be crowned winner of this year’s GBBO? Filmed over the course of 12 months, this documentary tells the story of five fires that occurred before the blaze which ultimately claimed the lives of 74 people in June of last year. In conversation with survivors, the bereaved, firefighters, safety experts and politicians, Jamie Roberts gives an insight into the incidents which potentially foretold the Grenfell Tragedy. Starring Steve Carell, Channing Tatum and Mark Ruffalo, this 2014 film is based on true life events. An Olympic gold-medalist wrestler is encouraged to join a millionaire’s personal team in a move which sees his career flourish, but when his brother is employed as the coach, things take a turn for the worst. Over the course of the weekend, The Chilling Adventures of Sabrina landed on Netflix. And naturally people immediately got bet in. But it wasn’t long before Irish viewers found themselves squirming over the mispronunciation of the word ‘Samhain’. While characters made reference to Sam-Hane, Irish viewers shrieked the correct pronunciation from behind their couch cushions before turning to Twitter to shriek it there. How do you pronounce Samhain? I always thought it was Sowen but in Sabrina, they pronounce it sam-hain and its really bothering me. I hope everyone watching Sabrina knows that that is NOT how you pronounce Samhain. Revolting Ireland (Virgin Media One, 10pm) With focus spanning from the financial crisis to present-day Ireland, this documentary looks at the events which helped shaped Ireland over the last decade. Celebrity Hunted (Channel 4, 10.20pm) Life on the run is taking its toll on this year’s batch of celebrities, especially for Vicki Pattison who seems close to cracking after finding herself a stone’s throw from home. Gogglebox: Celebrity Special for SU2C (Channel 4, 11.25pm) If you missed the original broadcast last Friday, now is your chance to catch up. Paul O’Grady: For the Love of Dogs: (Virgin Media One, 8.3opm) It’s got a host of gorgeous dogs, and frankly that’s all we need following the first day back to work after a Bank Holiday weekend.